Great flavor and easy to drink blended Scotch and the best part is the price. Really drinks better than the price indicates and an amazing value. Of you haven't tried it, you should. orange and vanilla on the nose, very little alcohol burn, not overwhelming flavor, but it is good, short to medium finish. Great value for a bottle. Smooth, no burn. Light vanilla and fruity flavors. Amazing value for the price. Top notch blended whisky and also very affordable. This is like one of your laid back friends who has a sketchy background but they're fun to hang out with. Very smooth blend of vanilla and honey. Not much burn at all. Great sipping scotch. Un whisky dit "de femme", excellent en toute occasion avec des personnes débutantes dans le whisky. Lots of honey, not much else. Nice and easy. Excellent example of Speyside for beginners. barley. roasted nuts. almonds. honey. Smooth and easy intro scotch. Vanilla or something similar. A nice sweet blending. A good whisky for starters. Approachable and inoffensive. Good if you are looking for straitforward caramel and honey notes. A sweet fruity and easy to drink. Yet there are more notes to find. An amazing blend for the price. Вроде и неплохой купаж, но цена не очень конкурентная, можно и односолодовый найти. тем не менее хороший вариант для тех кто любит покрепче. bon blend. vanillé. bon rapport qualité prix. The first Scotch I have found that I like. Very smooth. sweet vanilla flavour. the prise is very good - quite affordable. Smooth initially with hints of sweetness. Soon turns to sharp with hints of spiciness. No real ongoing aftertaste but very warming feel which lingers on. Overall a pleasant no nonsense everyday tipple for a blended whiskey at the price. A fresh whiskey, but without any special character. A good whiskey for a sit in with your student friends. A lovely scotch whiskey. smoother than I expected. Smooth, butterscotchy and easy on the palette. обалденный, настроение после на 100, послевкусие сухое. Очень рекомендую. Very smooth and no harshness but the flavour and smell fade quickly. Nothing wrong with it but not distinctive. Not all blended scotches are made equal, so don't sleep on this one. Tastes like a barrel dipped in melted butterscotch. Lovely on the pallet and the wallet. My gateway into whisky: smooth, friendly, easy to drink. Sweet on the nose and palate; caramel, vanilla. A solid whisky. This is a delicious blended scotch! Very approachable for people who are just getting into scotch and don't want a smokey taste. Great blend with a buttery flavour. Love the monkey’s on the bottle! easy drinker. good idea of what a blended malt can be at a low price point. strong smoke notes that linger on the pallet. I taste literally nothing else. Easily one of the best beginner whiskeys. Bright and not too complex, notes of apple or pear with the slightest spice note. Fruitig en zacht van smaak. Sehr guter blended, süss und leicht. Sweet and nutty with a hint of honey. Very woody neat. Tastes best with a little water added. Easy to drink, not too firey. Sweet with honey tones. smooth. Great easy to drink beginners whiskey. Very nice blend, easy sipping and an all-around crowd pleaser. Sweet and rich with a spicy finish; great value whisky that has plenty of taste and character. God og rund whisky der det er vanskelig definere en smak, men det er hint av vaniljesmak. Made by blending whisky from 3 distilleries including the Kininvie. Its soft and sweet, but not boring. Floral, earthy, harvesty notes. Nothing intense or edgy. But it tastes genuine, fresh and natural. This is my favorite blend. Pretty good scotch, not too much peat well blended. One of those you need to mix with coke... I'm very disappointed. Incredible value. not the best you will ever have, but nothing wrong with this considering the price tag. Nose is voluminous but quite flat and easy. Vanilla, cereals, raspberries, orange cest and a gingery or herbal spiciness. A bit more interesting than expected but not too enjoyable for my taste. The herbal touch comes in a medical way and it developes some salt and roasted nuts. Finish adstringend and drying with a really metallic bitterness. Good blend with vanilla and peaty notes. Very good blend of three great Speyside malts (Balvenie, Glenfiddich, Kininvie). Great value and great beginner scotch but in due time one’s palate craves a bit more complexity. good and cheap blend. The monkey is smooth. A blend of 3 malts. Voor het geld is het een whisky die in je kast hoort. Tried this with a friend, and he wholeheartedly agreed......this whisky smells and tastes like vomit. I can't go near this stuff. en dejlig let begynder whisky. First foray into Scotch whiskey and I must say, I'm impressed. Mild flavor, very little burn and no aftertaste. Fantastic for mixing with cola (Mt. Dew, yum). Glad I started with this brand. One reason I give this goodness a 95. It is excellent for mixing cocktails. Highly recommend for a inexpensive scotch. great stuff would definitely recommend! Not bad, but the taste is completely gone after 2 seconds. Good for mixing with cola I guess. found it diluted... with no real flavours confirmed. The first blend i have had. not the best. Exceptional value, at under $50 AU this is a great everyday dram. Versatile and well balanced. For a blend this has identity, sweet with notes of vanilla and honey. smooth, fruity, never gets bored. Very good for first time Scotch drinkers. Price is lower than I would have expected. Definitely best buy Whisky at the moment. Good for after work sip! Very drinkable. Sweet, soft and smooth. Great starter! Very smooth and flavoursome for a young whisky. Hints of marzipan on the finish. Decent blended whiskey, perhaps a little too floral on the nose. But I like the smoothness, the vanilla, and the oak. Sweet fruity. Not bad but there is nothing that makes me want more. Smoky smell but fruity taste. It has a rough feel that is displeasing for me since I prefer single malt whiskies. Very smooth and mild whisky. After taste is not very strong and doesn't last very long, but a nice whisky. Really nice. Sweet, gentle, quite smooth and a bit floral. Not overly complex or with a strong finish but very pleasant to drink. A great entry whisky and a good casual dram, which is sometimes all you need. Floral, vanilla, toffee, slight nuttiness. It's the worst of my collection. soft. fast fade of after taste. nice whiskey for beginner introduction. Smooth and delicious. Thoroughly enjoyable. For this price, a very tasteful blend. Maybe a bit too sweet. Fast fade of taste, but a really "well done" blend. A very nice blend, vanilla and honey. It became one of my favorite. This is my favorite blended Scotch. Mildly sweet, smooth, delicious, and affordable! Too sweet, should be classified as liqueur rather than whisky. The taste dissipates quickly and leave nothing but a watery remnant behind. As a basis for your drink, I can recommend this. As a whisky to enjoy neat, I would stay clear. Mildly sweet, nice honey scent. very affordable blend. vanilla/honey and a smooth finish. nice one for beginners and the more experienced. Bon rapport qualité prix pour ce malt blend. One of the better blended ones and not very expensive. I've never owned a bottle but have had it a lot when going out. I recommend going with a little water or one cube of ice for this one. As always, I tend to prefer a single malt, so I probably won't buy myself a whole bottle, but you can do a lot worse than Monkey Shoulder. Good, pleasant dram, for a blend. Definitely entry-level scotch, but a well-done one. nice whisky. little short in taste. easy to drink whiskey. soft smoothly flow. Malty / fruity / creamy whisky. Also honey. Good whisky under €50,00. full flavor,but all the flaver are a litter weak and short. Love it. One of the tastiest blended malt I have tried. 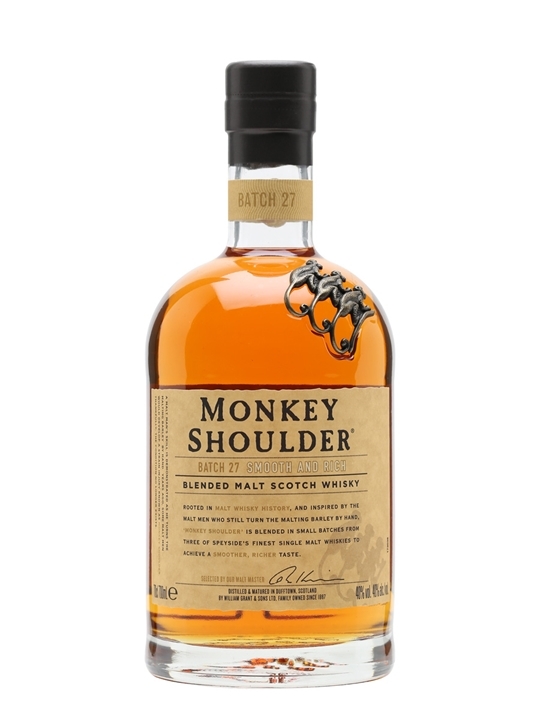 when I want to buy à good whisky without breaking, Monkey Shoulder is always my first choice. its a very good whisky, a bit smoky, some fruity nose. excellent overall at that price.